Very comfortable armchair with upholstered seat and back, elliptic arm rests, laid back tapered front legs. Available with Oak frame and covered in Halingdal fabric. The sawhorse was a theme Wegner was fond of using in both his table- and chair production, readily associated with woodworking. Among his sawhorse furniture, CH29, simply called the Sawhorse Chair, turned out to have the greatest impact and has achieved the status of a classic. 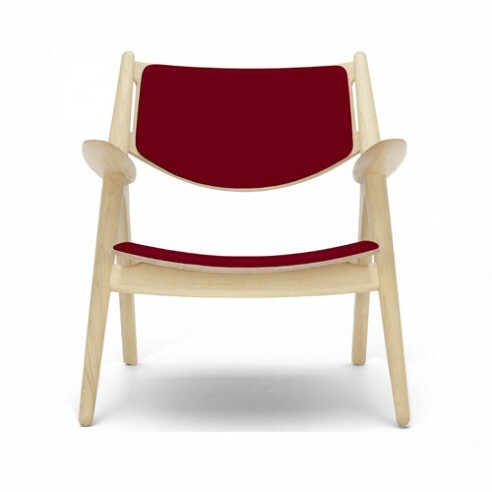 likeness to – and was a clear forerunner of – both the Folding Chair and the fixed version of Politiken’s canteen chair that Wegner designed in the 1980s with a seat that came in a variety of colours.